The competitors for season 20 of Dancing With the Stars have been announced and among them are former SEC defensive player of the year Michael Sam and gold medal-winning gymnast Nastia Liukin. The cast was announced on Tuesday's Good Morning America, and in addition to the athletes the group includes actress Suzanne Somers, singer Patti LaBelle and model Charlotte McKinney. After the announcement, Sam tweeted that his primary goal is still making an NFL roster. Both NFL players and gymnasts have a long history on the show, with Emmitt Smith, Hines Ward, Donald Driver and Liukin's 2008 Olympic teammate, Shawn Johnson, all taking home the competition's top prize. Olympic champion gymnast Laurie Hernandez won with dancing partner Valentin Chmerkovskiy in Season 23. IndyCar driver James Hinchcliffe finished in 2nd place with dancing partners Sharna Burgess (pictured) and Jenna Johnson in Season 23. Retired NFL wide reciever Calvin Johnson finished in 3rd place with dancing partner Lindsay Arnold in Season 23. Olympic champion swimmer Ryan Lochte finished in 7th place with dancing partner Cheryl Burke in Season 23. UFC fighter Paige VanZant finished in 2nd place with dancing partner Mark Ballas in Season 22. Pittsburgh Steelers wide receiver Antonio Brown finished in 4th place with dancing partner Sharna Burgess in Season 22. Denver Broncos linebacker Von Miller finished in 8th place with dancing partner Witney Carson in Season 22. Retired NFL quarterback Doug Flutie finished in 9th place with dancing partner Karina Smirnoff in Season 22. Triple Crown-winning jockey Victor Espinoza finished in 12th place with dancing partner Karina Smirnoff in Season 21. Olympic gymnastics all-around champion Nastia Liukin finished in 4th place with dancing partner Derek Hough in Season 20. Defensive end Michael Sam finished in 10th place with dancing partner Peta Murgatroyd in Season 20. NASCAR driver Michael Waltrip finished in 7th place with dancing partner Emma Slater in Season 19. UFC champion Randy Couture finished in 11th place with dancing partner Karina Smirnoff in Season 19. Olympic athlete Lolo Jones finished in last place with dancing partner Keoikantse Motsepe in Season 19. 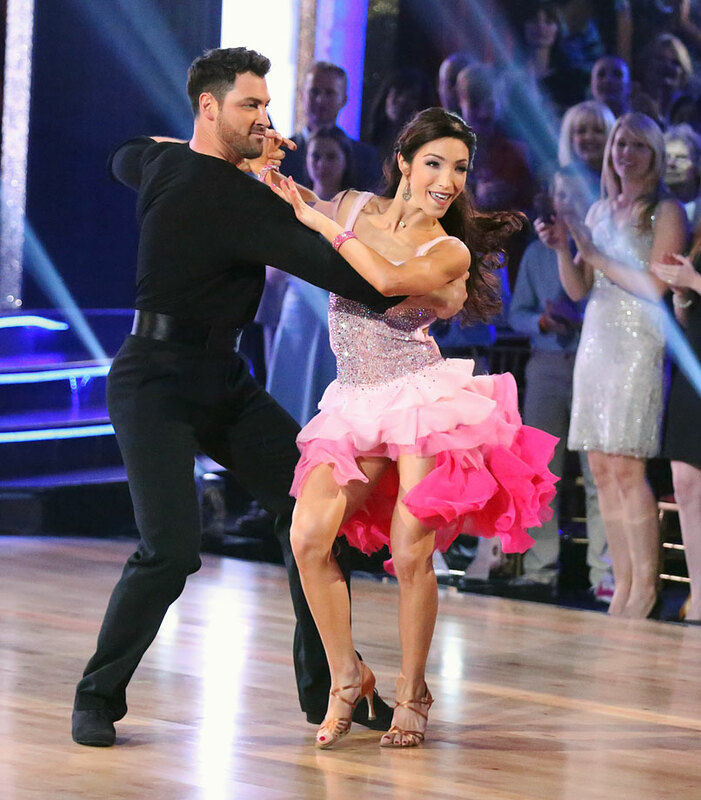 Olympic ice dancer Meryl Davis won with dancing partner Maksim Chmerkovskiy in Season 18. Paralympic snowboarder Amy Purdy finished in 2nd place with dancing partner Derek Hough in Season 18. Olympic ice dancer Charlie White finished in 5th place with dancing partner Sharna Burgess in Season 18. Retired NHL center Sean Avery finished in 11th place with dancing partner Karina Smirnoff in Season 18. Long-distance swimmer Diana Nyad finished in last place with dancing partner Henry Byalikov in Season 18. Retired NFL wide reciever and ESPN commentator Keyshawn Johnson finished in last place with dancing partner Sharna Burgess in Season 17. 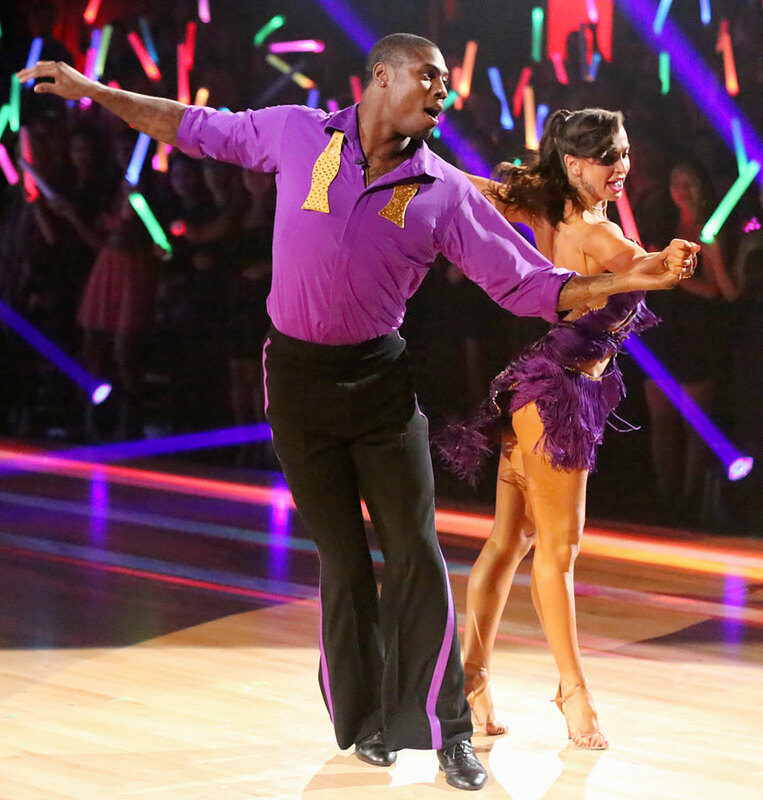 Baltimore Ravens wide receiver and return specialist Jacoby Jones finished in 3rd place with dancing partner Karina Smirnoff in Season 16. Olympic champion gymnast Aly Raisman finished in 4th place with dancing partner Mark Ballas in Season 16. Professional boxer and former WBC Welterweight Champion Victor Ortiz finished in 8th place with with dancing partner Lindsay Arnold in Season 16. Olympic champion figure skater Dorothy Hamill and dancing partner Tristan MacManus withdrew after only two dances due to a potential severe back injury to Hamill in Season 16. Green Bay Packers wide receiver Donald Driver won with dancing partner Peta Murgatroyd in Season 14. Retired professional tennis player Martina Navratilova finished in last place with dancing partner Tony Dovolani in Season 14. Soccer goalkeeper Hope Solo finished in 4th place with dancing partner Maksim Chmerkovskiy in Season 13. Los Angeles Lakers small forward Metta World Peace finished in last place with dancing partner Peta Murgatroyd in Season 13. Pittsburgh Steelers wide receiver Hines Ward won with dancing partner Kym Johnson in Season 12. Retired professional boxer Sugar Ray Leonard finished in 9th place with dancing partner Anna Trebunskaya in Season 12. Retired NFL quarterback Kurt Warner finished in 5th place with dancing partner Anna Trebunskaya in Season 11. Retired NBA small forward Rick Fox finished in 6th place with dancing partner Cheryl Burke in Season 11. Olympic champion figure skater Evan Lysacek finished in 2nd place with dancing partner Anna Trebunskaya in Season 10. ESPN reporter/sportscaster Erin Andrews finished in 3rd place with dancing partner Maksim Chmerkovskiy in Season 10. 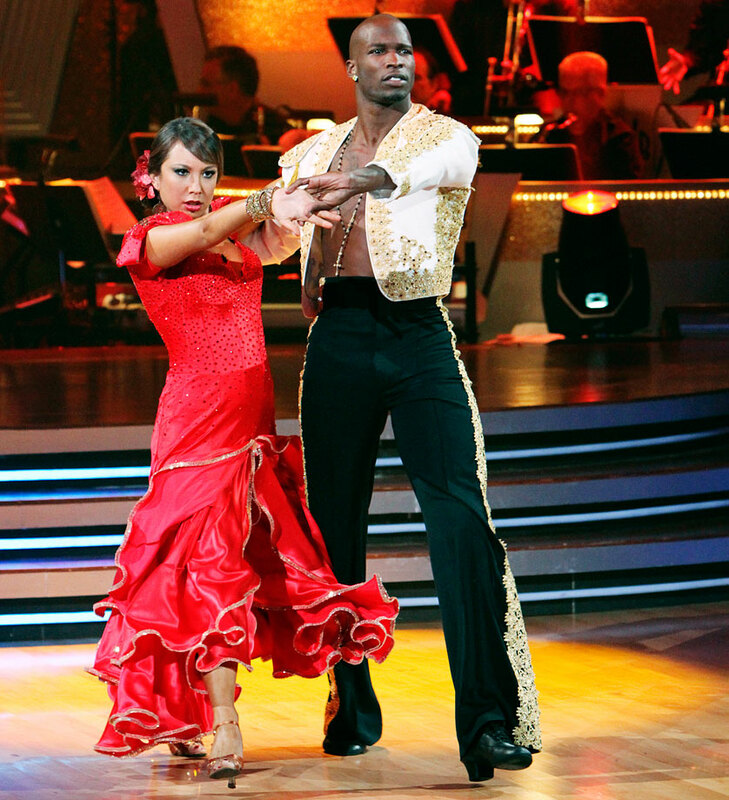 Cincinnati Bengals wide receiver Chad Johnson finished in 4th place with dancing partner Cheryl Burke in Season 10. NFL Hall of Fame wide receiver Michael Irvin finished in 7th place with dancing partner Anna Demidova in Season 9. Professional snowboarder Louie Vito finished in 8th place with dancing partner Chelsie Hightower in Season 9. Olympic champion swimmer Natalie Coughlin finished in 10th place with dancing partner Alec Mazo in Season 9. UFC Hall of Fame champion Chuck Liddell finished in 11th place with dancing partner Anna Trebunskaya in Season 9. Olympic champion gymnast Shawn Johnson won with dancing partner Mark Ballas (pictured) in Season 8 and finished in 2nd place with partner Derek Hough in Season 15's Dancing with the Stars: All-Stars. Rodeo champion Ty Murray finished in 4th place with dancing partner Chelsie Hightower in Season 8. NFL Hall of Fame linebacker Lawrence Taylor finished in 7th place with dancing partner Edyta Sliwinska in Season 8. Retired NFL defensive tackle Warren Sapp finished in 2nd place with dancing partner Kym Johnson in Season 7. 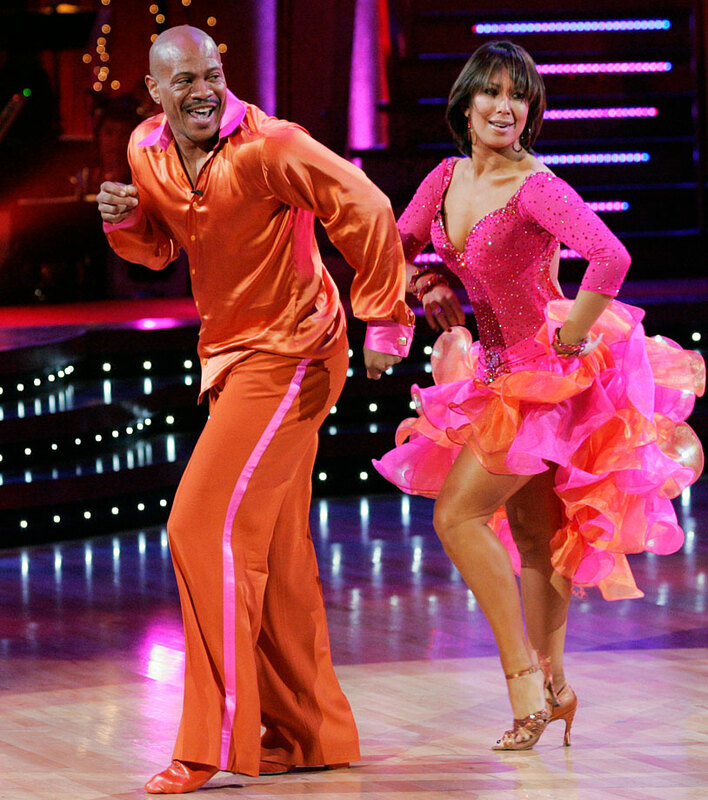 Olympic champion sprinter Maurice Greene finished in 5th place with dancing partner Cheryl Burke in Season 7. Olympic champion beach volleyball player Misty May-Treanor finished in 10th place with dancing partner Maksim Chmerkovskiy in Season 7. Olympic champion figure skater Kristi Yamaguchi won with dancing partner Mark Ballas in Season 6. Miami Dolphins defensive end Jason Taylor finished in 2nd place with dancing partner Edyta Sliwinska in Season 6. Retired professional tennis player Monica Seles finished in 11th place with dancing partner Jonathan Roberts in Season 6. IndyCar driver Helio Castroneves won with dancing partner Julianne Hough (pictured) in Season 5 and finished 10th with partner Chelsie Hightower in Season 15's Dancing with the Stars: All-Stars. Dallas Mavericks owner Mark Cuban finished in 8th place with dancing partner Kym Johnson in Season 5. Professional boxer Floyd Mayweather, Jr. finished in 9th place with dancing partner Karina Smirnoff in Season 5. Olympic champion speed skater Apolo Anton Ohno won with dancing partner Julianne Hough (pictured) in Season 4 and finished 5th with partner Karina Smirnoff in Season 15's Dancing with the Stars: All-Stars. Retired professional boxer Laila Ali finished in 3rd place with dancing partner Maksim Chmerkovskiy in Season 4. 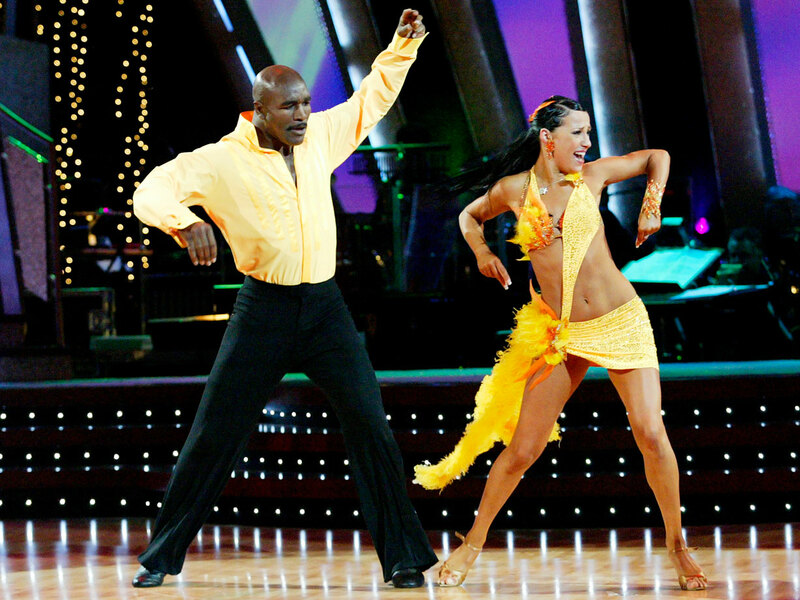 NBA Hall of Fame shooting guard Clyde Drexler finished in 8th place with dancing partner Elena Grinenko in Season 4. NFL Hall of Fame running back Emmitt Smith won with dancing partner Cheryl Burke in Season 3 and finished in 4th place with Burke in Season 15's Dancing with the Stars: All-Stars. NFL Hall of Fame wide receiver Jerry Rice finished in 2nd place with dancing partner Anna Trebunskaya in Season 2. ESPN anchorman Kenny Mayne finished in last place with dancing partner Andrea Hale in Season 2. Professional boxer Evander Holyfield finished in 5th place with dancing partner Edyta Sliwinska in Season 1.